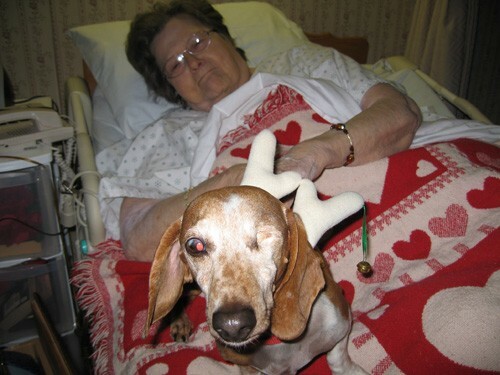 Pet therapy is widely accepted as a form of therapy for the sick, depressed, old and young alike. 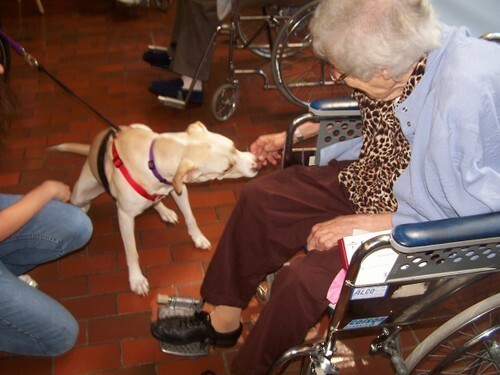 Our pet therapy program began in 1992 in Northbrook. In 2002 The Pet Sitters of America, Inc.’s founder Sandy Kamen Wisniewski made the difficult decision to discontinue the program through her company. 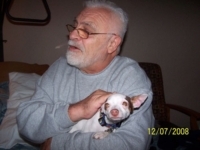 The company was not doing as well financially as it had in the past and the pet therapy program was one of the cuts that were necessary in order to keep the small business afloat. 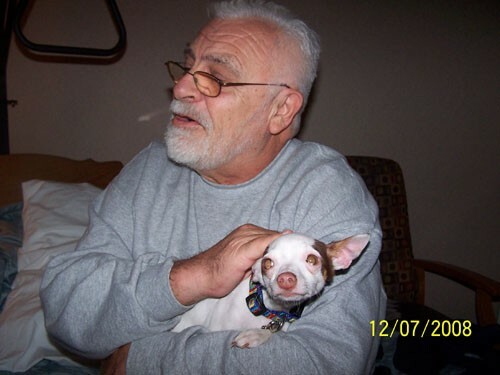 PSA ran the program for ten years, using their money, resources and energy to bring joy to many, many people. While it was sad to discontinue the program, Sandy felt that she had given back for a decade and now it was time to figure out another way to continue providing pet therapy to people. Around that same time she had to put her beloved Shepard/chow mix Mota to sleep. In his memory she began Animal Education and Rescue, NFP and decided to include the pet therapy program as part of the organizations goals. 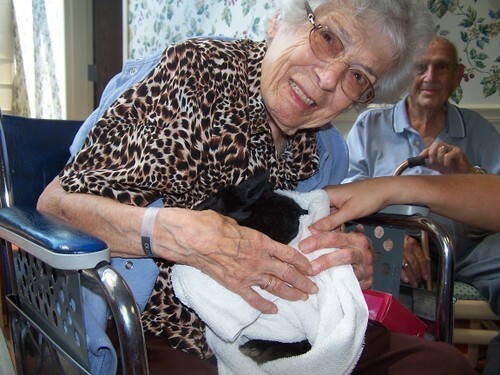 We visit area nursing homes on a monthly basis. The visits are in the evening in Lake County. For more information on where and when, contact us. 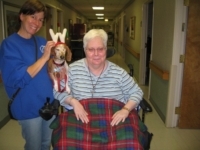 We visit other approved facilities that request pet therapy on an as needed basis. We visit approved homebound individuals as we have available volunteers/staff. INTERESTED IN HAVING US VISIT YOUR ORGANIZATION? Great. Please contact us using the link below or by calling us (847) 816-0831. INTERESTED IN VOLUNTEERING WITH YOUR PET? We love volunteers! 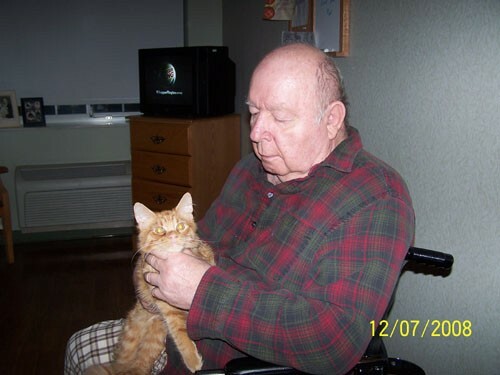 In order to volunteer with your pet, we need to prescreen and approve your pet first. 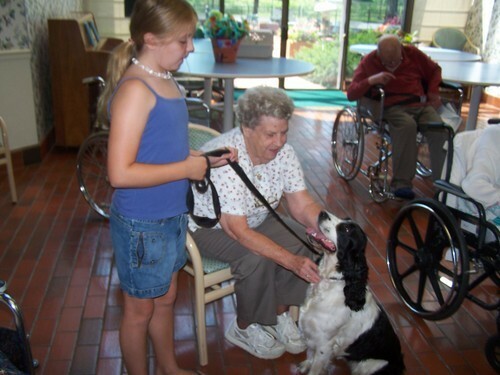 Visit our Pet Therapy Volunteer page to learn more about the guidelines and requirements involved.